This set of Compilers Multiple Choice Questions & Answers (MCQs) focuses on “Loop unrolling – 1”. 5. Is GCC a cross Compiler ? 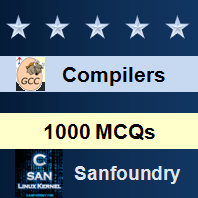 Explanation: GCC, a free software collection of compilers, also can be used as cross compile. It supports many languages and platforms. 6. The __________ is a technique for building cross compilers for other machines. 7. __________ was developed from the beginning as a cross compiler.